A Pastoral Letter On Celebrating the National Eucharistic Pilgrimage and Congress: Come, let us adore! A great and historic event is about to take place in Liverpool. It will involve several thousand Catholics coming together next weekend, representing millions of the faithful across England and Wales. This, the first National Eucharistic Pilgrimage and Congress to be held in our land for more than a century, has the title ‘Adoremus’ – ‘Let us adore!’ Whilst hundreds of delegates from this Diocese will take part in the Congress on the Friday and Saturday, the National Pilgrimage will close on the Sunday with an event open to everyone: a Blessed Sacrament Procession starting from the Metropolitan Cathedral of Christ the King at 1pm. I hope you may be able to take part in this act of public witness. However, I appreciate many will not be able to be physically present in Liverpool, so I write to invite you to be personally and spiritually part of this pilgrimage. Pope Francis spoke in June this year of how Christ now gives himself to us under the simple form of bread; this, the Holy Father declared, is “the only food which satisfies, for there is no greater love. There we encounter Jesus really …” It led Pope Francis to make this call to everyone: “Let us make Mass our priority! Let us rediscover Eucharistic adoration in our communities”. This is a beautiful description of the goals of the Liverpool Pilgrimage and Congress and explains how each of us can be part of it. It is a moment to renew our faith and love for Jesus, truly God and truly Man, who “makes himself wholly and entirely present” in the Blessed Sacrament of the Eucharist. In the words of Saint John Paul II, “Faith demands we approach the Eucharist fully aware that we are approaching Christ himself”. Today in the Book of Deuteronomy we read, “What great nation is there that has its gods so near as the Lord God is to us whenever we call to him?” (Dt 4:7). The answer to this question is now wonderfully given in the Mystery of the Eucharist. May we all draw closer to Him who desired to remain so close to us, and not become like those of whom Jesus says in the Gospel, this “people honours me with lip-service, while their hearts are far from me” (Mk 7:6). When the Church taught how we must each respond wholeheartedly to Christ’s Real Presence in the Eucharist, she turned to the Gospel scenes beginning with the wise men who fell down to worship the infant Jesus. In the same way the Church teaches that, “all the faithful of Christ … must venerate this holy sacrament with the worship which is due to the true God (latria) … For in it we believe that the same God is present whom the eternal Father brought into the world, saying ‘Let all the angels of God worship Him’ (Heb. 1:6), whom the Magi fell down to worship (cf Mt 2:11) and whom finally, the apostles adored in Galilee as Scripture testifies (cf Mt 28:17). In the first centuries of the Church, Saint Augustine expressed this call to adore the Sacrament of Christ’s Body and Blood saying, “No one eats that flesh without first adoring it, we should sin were we not to adore it”. 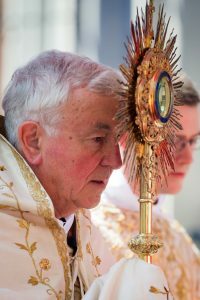 Eucharistic Adoration is the consequence of the Eucharistic celebration which is itself the Church’s supreme act of adoration, as Pope Benedict explained, “Receiving the Eucharist means adoring him whom we receive”. Next Sunday I wish to encourage you to make your own personal pilgrimage by spending some generous time in adoration of Jesus truly present in the Blessed Sacrament. Saint John Vianney said this time will be the happiest moments we spend on earth! Let us also make reparation for all our coldness and indifference towards so great a Gift as we recognise that “In the Eucharist Jesus does not give us a ‘thing,’ but himself”. May this also be a moment to pray for those in our own families, parishes and our nation as a whole who may have lost sight of so great a Love revealed in the Eucharist, “a love which knows no measure”. May this coming Sunday be marked by such adoration renewed not only in the hearts of the delegates gathered in Liverpool but in every parish and community of our Shrewsbury Diocese. Let us hear the invitation in the memorable words of Saint John Paul II, “Jesus waits for us in this sacrament of love. Let us be generous in going to meet him in adoration and contemplation that is full of faith … May our adoration never cease”.